Every year for the last 99 years Americans and resident aliens fill out Form 1040 U.S. Individual Income Tax Return. This is a starting point to report your earnings to the Internal Revenue Service. Even though the form has evolved during that time it has remained short. It was designed to contain the most important information about taxpayer, a snapshot if you will, without complicating it unnecessarily. All the additional calculations come on the supporting forms and schedules. So, even though Form 1040 is just a few pages long, tax returns can have hundreds of pages. Why it is called Form 1040? There’s nothing special or mysterious about it. The IRS assigned it that number, as it was the very next form created and the very next number available. When to file Form 1040? Do it on or before April 15th, unless you file for extension. Where to file Form 1040? That depends on where you live. Instructions to the form contain all necessary addresses. The most complete and important one is Form 1040. Its synonym is the “long form” in order to fit into all tax scenarios. But there are other variations of Form 1040 to better accommodate certain tax situations. 1040A – for annual income less than $100,000 and standardized deductions. 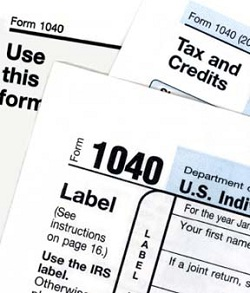 1040EZ – for simplest tax returns; assumes no dependents or adjustments to income. 1040NR – non-resident aliens earning income in the U.S. file this form. 1040X – if any changes have to be made to already filed tax return. If you’re unsure which form to use, just go with Form 1040. If you file taxes using tax preparation software, just follow the interview process and the software picks the most appropriate form for you. What are the supporting schedules for Form 1040? Schedule A – if you’re itemizing your deductions, that’s the form to use; include medical and dental expenses, interest you paid, gifts to charity. Schedule B – interest and ordinary dividends; list institutions that paid you interest and/or dividends and their amounts. Schedule C – profit or loss from business; if you’re a small business owner, that’s where you list all the business deductions you’re taking; it’s your business’s income statement. Schedule C-EZ – similar to Schedule C but much simplified; certain conditions apply. Schedule D – capital gains and losses from short- and long-term investments. Schedule E – supplemental income and loss from activities such as real estate rental, royalties, estates or trusts; provides section to calculate expenses incurred to obtain income from rents. Schedule EIC – if you take earned income credit provide the IRS with information for each qualifying child. Schedule F – profit or loss from farming; this is an income statement listing all your farm income and related expenses. Schedule H – household employment taxes; if you employ any household help, this schedule helps you calculate social security and medicate taxes you have to pay and federal unemployment tax. Schedule J – income averaging for farmers and fisherman; similar to Schedule F but it averages the numbers over 3 year period. Schedule R – calculate amount of credit if you’re over 65 or disabled; answer series of questions to determine the appropriate credit amount. Schedule SE – a flow chart helps you determine whether or not you have to pay self-employment tax from your business activities that you typically report on Schedule C or Schedule F.
There are other Schedules A, B, C, and so on but they support different forms. Just make sure that the schedules you’re filling out support the form you need to file. If you have your taxes prepared by an accountant, he/she will know which schedules to use. Tax preparation software such as TurboTax, TaxACT, or H&R Block automatically fill out the necessary forms and schedules based on the information you provide.